LIGHTSHIPS are employed to mark sandbanks or other obstructions to navigation where it is impossible to erect a stone or steel lighthouse. Their design and arrangement vary with different countries and duties, as will be seen. The Seven Stones light is one of the older British lightships maintained by Trinity House. She is non-self-propelling and has a distinguishing mark on the mast. Lightships of this type are generally of wooden construction. In the later ones the lantern is fixed on a tower amidships. The Elbe light is a German example marking the entrance to the port of Hamburg. Self-propelled by an oil engine and of steel construction, she has a hull designed on schooner lines. The fixed position of the light on a mast amidships should be noted. The Heald is a characteristic American lightship guarding the Heald Bank shoal, and she is self-propelling, with steam machinery. The large funnel with big, locomotive-type fog-whistle at the top and the lantern fixed high on a strong foremast should be observed. There is also a navigating bridge, and the hull, of steel, is sturdy, and she has a big sheer forward. The Humber light is automatic and unattended. The lantern, with distinguishing mark on the top, is on a steel mast; the hull is of the barge type. 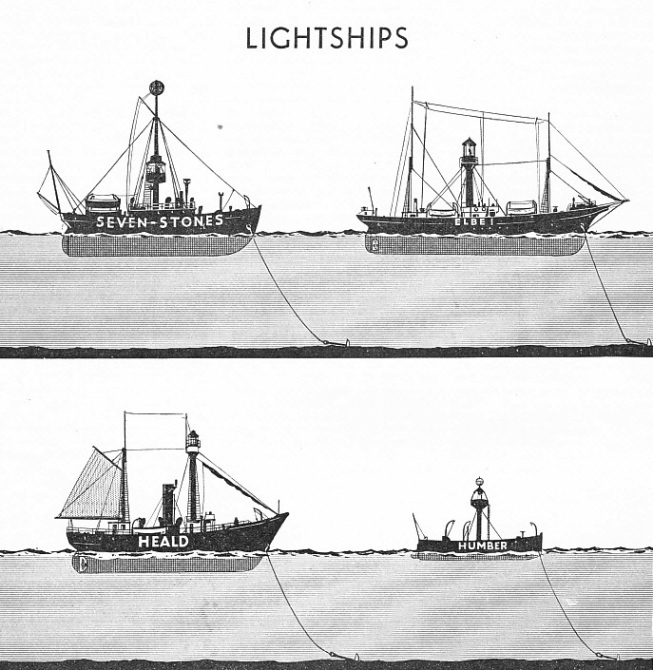 Simple anchoring is shown, to denote that the vessels are moored; in practice lightship anchoring is elaborate. You can read more on “Buoys and Beacons”, “Day and Night Signals at Sea”, and “Signalling at Sea” on this website.